Rivers state governor, Nyesom Wike says only the Peoples Democratic Party, PDP, can rescue Nigeria in 2019. 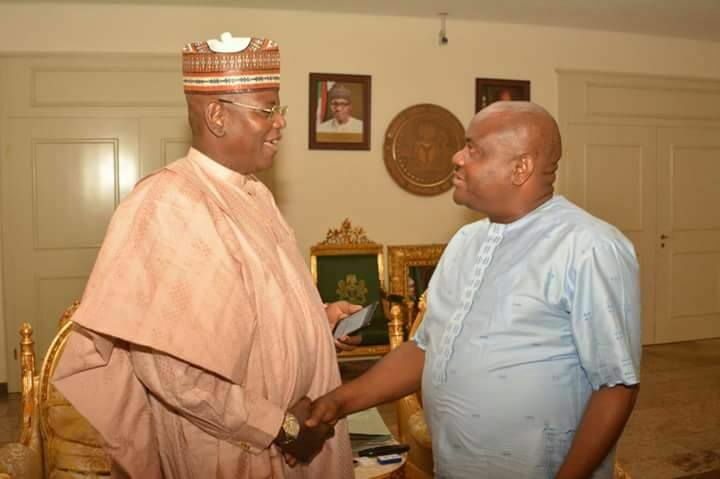 He spoke yesterday in Port Harcourt when former Governor of Jigawa, Sule Lamido, visited him to declare his intent to vie for the party’s presidential ticket. Wike described APC as a party of strangers, that enjoys condemning the opposition. “If you decamp to the APC, you are no longer corrupt, APC is a party of daylight deceit”. “I am happy that one of those who left to bring a messiah, has realised that the so-called messiah they brought is no longer the messiah Nigerians expect, PDP is the only hope for Nigeria,” he stressed. He said that though the PDP made mistakes in the past, the party was the only platform with the commitment and patriotism to take the country out of the current situation. Wike stated that the present political and economic situation in the country needed politicians with courage to deliver the country. In his remark, Lamido said that he was offering himself to take over in 2019 because the nation deserved to move forward. He lamented that the APC had dragged Nigeria backwards. The one-time Foreign Affair Minister said that if given the opportunity to lead Nigeria, he had the capacity to unite Nigeria and set it on the path of growth.